Let’s talk about med school acceptance rates. Which schools have the lowest acceptance rates? The 120 med schools ranked by U.S. News in their 2017-2018 survey, had an average of a 7% acceptance rate, while those with the lowest acceptance rates averaged a mere 2.8%! Unranked schools, which did not meet certain criteria required by U.S. News to be numerically ranked, were not included in this report. *RNP indicates a school that is ranked in the bottom quarter of all rank-eligible medical and osteopathic programs. U.S. News calculated a rank for those schools, but elected not to print it. 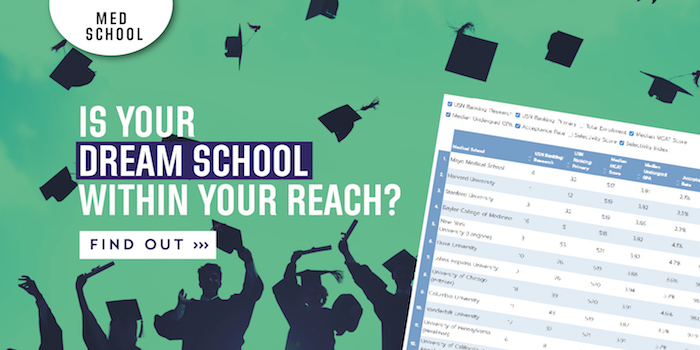 Is your heart set on going to one of these highly competitive medical schools? Check out our Medical School Application Services for one-on-one guidance that will help you get ACCEPTED!